I have been tagged by Jan at the Polka Dot Barn. So, the rules are for me to link back to her and list six other bloggers that I want to know more about. As a team player, I think it would be the funnest (is that a word?) 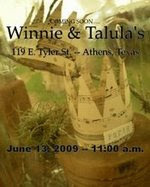 to learn more about some of the lady dealers coming into Winnie and Tulula's. Don't you? This will be fun! Well, that is, if they have the time to play. You know, we only have until June 13, to prepare for our grand opening. 1. Maggie at The Veranda. 2. Lillie of the Junk Palace. 3. Donna at Curious Goods. 4. Theresa of Garden Antqs Vintage. 5. Debbie at Talking Trash. 6. Gloria at The Sweet Pea Collection. I truly do not expect to hear from Gloria, the Queen Mother of Winnie & Tulula's. She is one busy woman, preparing the building for all of us. She keeps telling me that when I meet her, she will be the one looking like a homeless woman. Bless her heart! She is working it, for sure! Just go peruse her site and love that music. Great stuff! Now. My task is to tell you six things that you might not know about me. And I will do that...But, as always when I am tagged, I make up rules. Let's see...alright tagged ladies, share with us 6 things that you might be bringing to Winnie & Tulula's for the Grand Opening. You can tell us 6 things about you, too, if you have time. I know you are busy! 1. I love Burt's Bee's chapstick. 2. Mrs. Meyer's home cleaning products rock. They are like perfume for my home AND they are functional. 3. My very first car was a Ford Pinto. And I live to tell about it. 4. I lettered in golf in high school. 6. I have 4 indoor cats: Ellie Mae, Jethro Bodene, Opie Jo and Country Bumpkin (Bunky). Am I country or what? Now, you ladies who were tagged, you can take any or part of this assignment. If you desire, link back to me and then list those 6 things, and then tag 6 more bloggers. The rest of you, check out these talented women and you will soon figure out how excited I am to be a part of this new venture! The Poetry Community Yard Sale is tomorrow from 8:00am-1:00pm. Y'all come see us! I'll try and get a post up in the next few days. As Lulu would say, I am up to my armpits in alligators these days! 2. I am sickened that Mindy thinks cleaning products rock. 3. My first pet was a dog named Poochie. I thought he was so smart that he must have escaped from the circus. 4. I was my Choir President in high school. 6. In 1995 I moved myself and my 3 children, aged 2, 4, and 9 into my mothers house. She was 79 years old. * see item #5. You forgot to mention that Gloria will also be the one with the soap in her mouth!! She said she's used it a lot this week. And, not for cleaning, unless you consider a potty mouth needing to be cleaned. I told her I can so relate when setting up for the shows. Ok, I'll have to do a post later in the weekend because I've been garage sailing this morning and I'm preparing my little outdoor room with goodies for sale!! Yipee and...it's my birthday weekend, ya hoo, the big 45!! Happy Memorial Day! Hope your day was a success! i LOVE a team player! i have no idea what you're talking about, this thing on june 13th. you've probably blogged about it and i haven't gotten to your blog yet. i'm slow. i've been reading as fast as i can and as often as i can and i'm only on the "k"'s. i need a lot more hours in my day to get everything done. Or I need to give up art so I can focus on my blog friends. So where do i find out about this june 13th thing. i just might come. Hope you will stop by my blog and read about little Maggie. This is an urgent prayer need. I have seen the power of prayer over and over in the blog world. I have a button for anyone that would like to add it to their blog. It was so good to meet you! We are gonna have a ton of FUN in the Fall!!! More fun going on! and all that shabby stuff. Have a ball! LOL! I love your cat names! !